This will be the first of a short series of reports that detail how CLS aims to deliver projects with best practice methods. I hope this series will help our members with some hints to assist them in getting the best results with your own revegetation or gardening efforts on your own blocks. 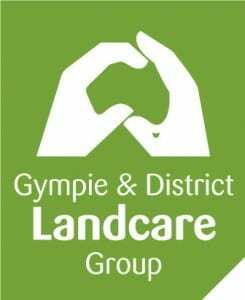 I will be covering dealing with drought, in this first instalment and will cover other helpful topics such as; organic revegetation, weed management, species selection, maintenance, in later instalments. Lets get down to business! 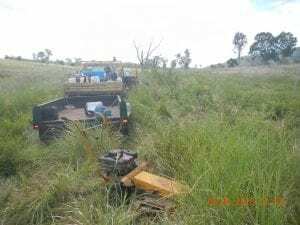 Drought is not an easy time for revegetation work. It can disrupt the flow of a project, and if you plan your project poorly you could end up wasting a lot of time and money. 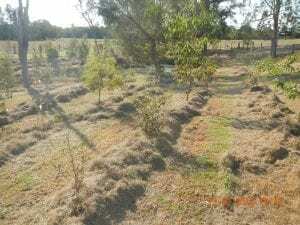 Photo of Bob Hoods Gully, Revegetation after 12 months. Good project plans will have a plan A and plan B which can deal with a drought. In the planning phase of your project you need to consider what the site conditions will be like in good rainfall like a La Nina year and what you will do in an El Nino. CLS will concentrate our planting around rainfall events to take advantage of soil moisture and maximise survival of our tubestock. I think a lot of you at home regularly water your trees after planting them which is fine and often gets a good result in the end, but now consider a project with 1000 trees or even 10000. How do we water them? Well we usually don’t… and still get successful project outcomes. How do we do it? Read on. Planting schedules have to be flexible. In Cooloola Shire the wet season is summer followed by a dry season in winter, but you can get spring and autumn storms as well. Plan to get your site prepared before the rains come so that it is ready to go when the rain arrives. Then watch the weather and wait. It is far cheaper to water 1000 trees in pots than 1000 trees planted across 1Ha of paddock. Slow growth of your tube stock down while holding them by withholding fertiliser and placing them under shade for longer. When the soil on site is moist plant, we often do all our planting in 3-4 days followed by a break until the next rain. A rain event such as 150mm is required to recharge the soil moisture after a long dry period so don’t be fooled by 6 – 10mm and race out planting at the first sign of showers. Often autumn rains can be the best time to plant as the soil stays moist for longer. Temperatures are dropping causing evaporation and transpiration decrease, and this is helped by foggy dewy mornings. Weed growth is also better at this time and you’ll need to stay on top of the annual weeds. Summer rains can be okay but often summer storms are followed by weeks of long hot days, and the soil can dry out too quickly. Planting methods will have a lot to do with survival. All tubestock are soaked in tubs before planting. Soaking the roots for 5mins prior to planting makes the biggest difference. In wet soils you may be able to dry (without any watering) plant the trees as the soil will stay wet for a few weeks. In moist soils we use aqua spears. We plant with aqua spears exclusively once the soil moisture is less than ideal. Aqua spear planting allows you to dig the hole and break up soil clods whilst adding 2-6 litres to the hole and surrounding soil at the same time. Good compaction of the surface soil on the planting hole is essential to lock in the moisture. If there is any on site mulch drag it in over the root zone to help repel weeds from the moist soil. Aqua spear planted trees do not need watering for about six weeks but if backup rainfall occurs they will not need watering ever. Hedoli Gully after 3 months, showing our walk-behind slasher and one of our Quickspray units we use for Aquaspear planting. Maintenance is reduced during a drought as spray work usually holds until further rainfall. It can be a good time to catch up on maintenance get set for the next growth season. If you have a lot of onsite dry grasses these can be cut and used to mulch around the trees. A quick spray around the trees and mulch over the top will last for months. This will help with retaining moisture and cool the soil in the root zone. Slashed grasses make great mulch, or lawn clippings from a mower catcher. On the other hand, they can create a dry water proof layer if placed too thick around plantings. Watering when needed – Do not leave it too late to water, once tubestock have died back due to drought they usually do not recover and you could waste a lot of time watering a sick dying plant that never recovers. The best option is to be ruthless and not water, and if there is 10% losses replace them once more when rain occurs. This way only the strongest stock and species survive. If you have done your homework on species selection, drought should not be a problem to the overall success but it will slow down growth. Dry rainforest species should be avoided in drought as they have sensitive roots which do not recover well. Water the plantings closest to established trees first as the soil dries out quicker in these areas despite being shaded. The soil stays moist far longer out in the paddocks than under trees. Do not water plants that have reached 1m tall as they are already established and continued watering will only encourage a poor root system and trees than blow over. Avoid all unnecessary watering and you will get stronger better trees with well-developed root systems. Herbicides – we avoid most foliar herbicide use once weeds are wilting or in drought stress. Treatment in these conditions often leads to herbicide resistance. Cut stump and physical control can continue for much longer so we favour these methods. Glyphosate can continue to be used for some time into dry weather but the kill will be slower and will fail on woodier weeds. Kamba should never be used around trees in dry conditions as you may kill them. Use additional surfactant and maximum rates and coverage during dry weather. For cut stump application Apparent Slogger will continue to be effective into dry weather but glyphosate is useless in dry weather. Mulching is an excellent alternative to spray maintenance in dry weather. I hope this helps and encourages you to try some of these methods. Now we have finally had some rain it is a great time to get out planting in the Gympie region.